The Combi-WR is the first purpose built pedestrian reach stacker with the ability to operate in a VNA aisle of just 2.1m and with a lift capacity of 1,450kg. Its excellent ergonomics make it easy and stress free to operate. The unique patented multi-position tiller enables push button rotation of the rear wheel parallel to the chassis and back, allowing the operator to remain in the safest possible position when placing and picking in narrow aisles, namely at the side of the unit rather than between the truck and the racking. This improves forward visibility and greatly reduces the risk of incidents in tight confines. The Combi-WR, winner of the FLTA Award for Ergonomics 2014, is the only Walkie reach stacker with the ability to operate in a VNA or very narrow aisles down to an aisle-width of 2m pallet to pallet. 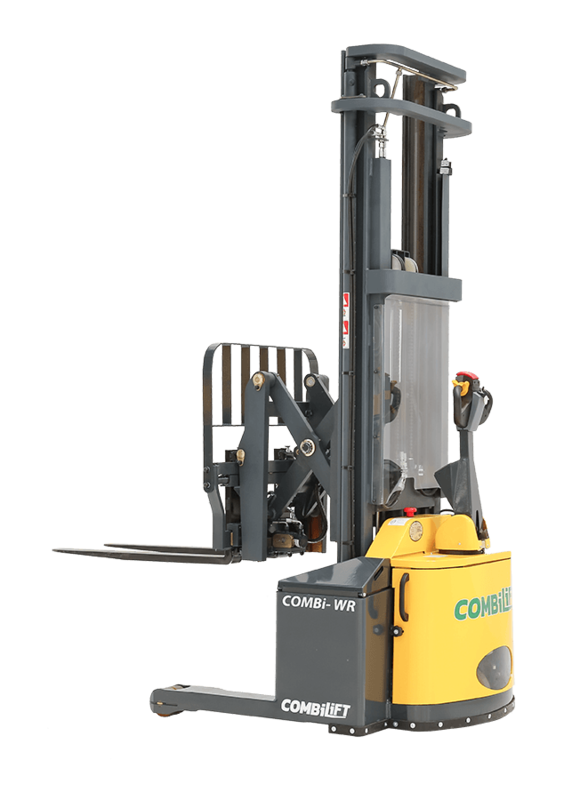 Incorporating the benefits of AC technology in its traction, pump and steering motors, the Combi-WR has a lift height that can be tailored to your application with load capacities up to 1,450kg. Electronic power steering and fingertip controls ensure effortless operation, even in the most demanding environments. Equipped with our patented multi-position tiller arm the Combi-WR offers safer operation. The tiller can be turned to the left or right, allowing the operator to remain at the side, providing full visibility of the load and forks, while maintaining full steering control, enabling greater awareness of their surroundings which enhances overall safety. Standing to the side of the stacker eliminates the risk of being trapped or crushed while allowing the Combi-WR to operate in very narrow aisles.